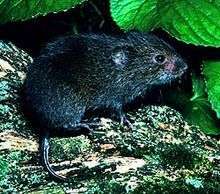 The Cricetidae are a family of rodents in the large and complex superfamily Muroidea. It includes true hamsters, voles, lemmings, and New World rats and mice. At almost 600 species, it is the second-largest family of mammals, and has members throughout the Americas, Asia, and Europe.